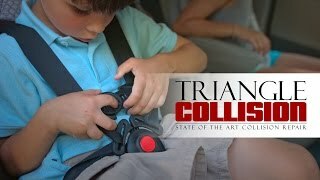 Triangle Collision has built a reputation for delivering quality, Certified Chrysler repairs with a hassle free experience. When you leave your vehicle with us you can rest assured that it will be returned to you in pre-accident condition. As a member of the Assured Performance Network, we always follow the Chrysler manufacturer guidelines for our repair process. If you live in the Morrisville or Cary area and have a Chrysler that was involved in an accident, contact Triangle Collision at (919) 460-7693 or fill out an online form! We stand behind our Certified Chrysler repair with Lifetime Warranties for many of our services. Your safety is our top priority. We guarantee that our repairs will keep your safety and performance features functioning as they were built to. You never expect to need collision repairs, which is why we want our customers to know that they have a trustworthy place to turn in the event of an accident. We are there for you every step of the way. From towing, to structural repairs, to refinishing. All of our services come with the same dedication to quality workmanship and customer service. Our Certified Chrysler repairs follow factory guidelines to make sure that the performance and safety of your vehicle is restored. It’s your choice, not the insurance companies, where your vehicle is repaired. Choose Triangle Collision, the Cary, NC area’s premiere Chrysler Body Shop & Collision Center. We emphasize our factory-approved repair techniques and tools because we know that it’s the only way to get the job done right. In order to achieve the performance and safety of modern Chrysler’s, the manufacturers have had to invent increasingly complex designs. To maintain the integrity of the vehicle, these parts must be put back together the way the factory intended. We put in the effort and investments to stay up to date with the industry. We believe that our customers should trust that their vehicles are performing up to factory standards. The industry has been pushing for safer vehicles, and Chrysler is among the highest rated for safety. New technologies are focused on not only protecting passengers during a collision, but preventing collisions from happening. These advanced features require specialized tools and understanding to repair after a collision. We are dedicated to providing only high quality repairs because the safety of our customers is our number one priority. We ensure that your vehicle will function as Chrysler intended in the event of another collision. You want your Chrysler look just as good as it did prior to the collision. We can achieve this onsite with our paint facilities equipped with BASF technologies. Our paint services are backed by our Lifetime Warranty, and are guaranteed to match the factories original color.